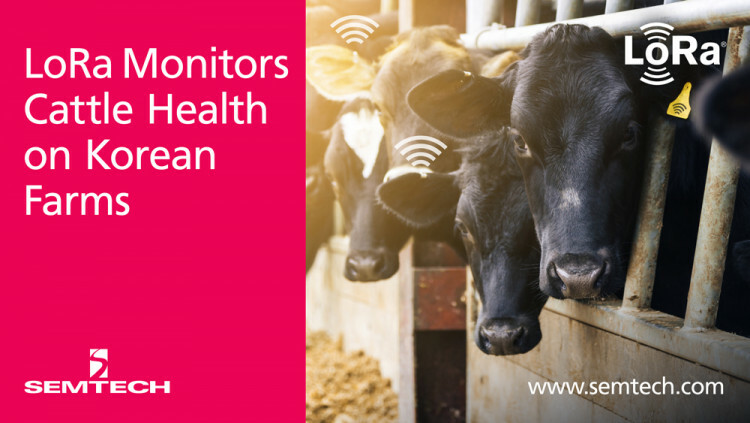 CAMARILLO, Calif., Oct. 11, 2018 – Semtech Corporation (Nasdaq: SMTC), a leading supplier of high performance analog and mixed-signal semiconductors and advanced algorithms, announced that SK Telecom, one of South Korea’s largest telecommunication providers, has created an Internet of Things (IoT) cattle healthcare solution leveraging Semtech’s LoRa® devices and wireless radio frequency technology (LoRa Technology). The product, LiveCare, is a LoRa-equipped bio-capsule which is implanted into a cow’s gastrointestinal tract and monitors for a variety of health indicators. LiveCare’s LoRa-based IoT hardware is embedded in a bio-capsule, and the device implants itself in a cow’s ruminant stomach to continuously collect data. Ranchers monitor the data transmitted from the devices for anomalies in a cow’s body temperature and other vitals to detect the onset of disease, estrus and to forecast delivery of calves. Unlike other solutions, the LiveCare device is shielded from being tampered with by outside conditions due to its strategic position inside the cow itself. This solution is expected to drastically improve the quality of life for the cow and by extension the cattle as a whole on the dairy farm. Healthier cows result in higher quality of milk, meat and higher earnings for the farmer. A trial run on a South Korean farm using the technology showed an increase in annual milk harvest of 1,200 liters per cow, an increase of $1,100 in income per cow for the farmer and an additional $400 in savings for each estrus successfully planned using the LiveCare solution. SK Telecom plans on extending its services to provide automatic notification to ranchers of contagious disease as well as location tracking in the near future. Semtech’s LoRa devices and wireless radio frequency technology is a widely adopted long-range, low-power solution for IoT that gives telecom companies, IoT application makers and system integrators the feature set necessary to deploy low-cost, interoperable IoT networks, gateways, sensors, module products, and IoT services worldwide. IoT networks based on the LoRaWAN™ specification have been deployed in 100 countries and Semtech is a founding member of the LoRa Alliance™, the fastest growing IoT Alliance for Low Power Wide Area Network applications. To learn more about how LoRa enables IoT, visit Semtech’s LoRa site and join the LoRa Community to access free training as well as an online industry catalog showcasing the products you need for building your ideal IoT application. All statements contained herein that are not statements of historical fact, including statements that use the words “expected to,” “plans,” “designed to,” or other similar words or expressions, that describe Semtech Corporation’s or its management’s future plans, objectives or goals are “forward-looking statements” and are made pursuant to the Safe-Harbor provisions of the Private Securities Litigation Reform Act of 1995, as amended. Such forward-looking statements involve known and unknown risks, uncertainties and other factors that could cause the actual results of Semtech Corporation to be materially different from the historical results and/or from any future results or outcomes expressed or implied by such forward-looking statements. Such factors are further addressed in Semtech Corporation’s annual and quarterly reports, and in other documents or reports, filed with the Securities and Exchange Commission (www.sec.gov) including, without limitation, information under the captions “Management’s Discussion and Analysis of Financial Condition and Results of Operations” and “Risk Factors.” Semtech Corporation assumes no obligation to update any forward-looking statements in order to reflect events or circumstances that may arise after the date of this release, except as required by law.